To educate public as to agricultural history of Bergen County. Resting like a jewel in the suburban town of Park Ridge, New Jersey, is the Wortendyke Barn, a County-owned Dutch Barn Farm Museum. This National Register county landmark, in addition to its attending red sandstone farmhouse across the street, is all that remains of the Wortendyke Farm which originally covered over 460 acres in northeastern Bergen County in the town of Pascack, now called Park Ridge. The barn, like many other of the old Dutch barns, could be found throughout 18th and 19th century Bergen County, which included present day Hudson, Bergen, Passaic, and part of Essex County, in northern New Jersey. The Wortendykes settled in the area in 1735 when Frederick Wortendyke, Sr. purchased the acreage from Hendrick Vanderlinda. The Wortendyke family maintained the land as a working farm from 1735 to 1851 when the farm was sold. It remained an ongoing farm owned by the Wortendykes for over 115 years - from before the French and Indian War until nine years before the start of the Civil War. The Wortendyke Barn Museum's exhibits include handmade 18th and 19th century farm implements and tools, the history of the Wortendyke family farm, and exhibits showing the agricultural history of Bergen County from the first settlers until the present. The Revolutionary War and its impact on the Wortendyke family is touched upon. The main feature of the museum is the barn building, an outstanding example of the vernacular architecture referred to as a "New World Dutch Barn." Wherever the Dutch settled along the Hackensack, Passaic, Raritan and Millstone Rivers and their tributaries, the heavy timber frames of these three-bayed, door-in-the-gable-end barns were raised. Other locations were along the Hudson and Mohawk Rivers, and Schoharie Creek in New York State. In the United Provinces a section of the barn included living quarters for the farm family whereas in the New World the barn and dwelling were separate. Possibly this was to lessen the danger of losing the barn to fire from the household heating and cooking operations, and/or because firewood was plentiful and the warmth of the livestock wasn't needed to augment the fireplace. Dutch Barns were constructed of local timber, down to the wooden fasteners called trunnels or pegs. Due to the ravages of time and the advancements in agriculture that have taken place over the last century and a half in this area, there are only a few examples of this type of barn extant. The accompanying illustration shows the barn's timber frame construction. The H-frame with the heavy horizontal summer beam provided great strength. Written by: Robert L. Cohen. Mr Cohen holds a B.A. and advanced degrees from Rutgers University. He is the curator of the Wortendyke Dutch Barn Farm Museum and the Demarest House Museum at New Bridge Landing Historic Park, River Edge, NJ. Mr. Cohen's articles have appeared in de Halve Maen and other scholarly journals. The following is a useful bibliography on Dutch barns. You can also refer to de Halve Maen, journal of the Holland Society of New York, 1924-Present, for articles on early Dutch culture in New Jersey. Andersby, Eric; Greenwood, Alexander; Franklin, David. Barn: The Art of a Working Building. Houghton Mifflin Co., NY, 1992. Dukdley, Eric and Dudley, Whitney. The Barn: A Vanishing Landmark in North America. New York Graphic Society, Greenwich, CT, 1972. Fitchens, John. The New World Dutch Barn. Syracuse University Press, Syracuse, NY, 1968. Manning, Alice E. Nineteenth Century Farmsteads on the Inner Coastal Plain of New Jersey. Drew University, 1983. 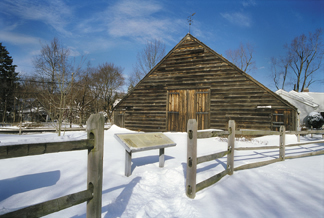 The Wortendyke Barn Museum, a National Register landmark, is all that remains of the original 460-acre Wortendyke family farm.The barn, built circa 1770, is an outstanding example of the vernacular architecture referred to as a "New World Dutch Barn" which could be found throughout 18th and 19th century Bergen County. Today there are probably fewer than 100 of these barns left. The main feature of the museum is the barn building. It was made completely of local wood, down to the nails called trunnels. Massive anchor beams, supported by posts creating an H-frame, support the entire structure. They tended to be wider than long with very steep, sloping roofs that allowed for the large storage area. These barns were built to store diversified crops with the side bays used for keeping a variety of animals and the hay stored above in very large, roomy haylofts. The large entrances on both gable ends allowed for the efficient unloading of the wagons. Because the floors were raised off the ground on a sill, the wood plank floors could last for decades. The Wortendyke Barn Museum's exhibits include handmade 18th and 19th century farm implements and tools, the history of the Wortendyke family farm, and exhibits showing the agricultural history of Bergen County from the first settlers through the 20th century. The Wortendyke family settled in this area in 1735. From 1735 to 1851 when the farm was sold, the land was maintained by the family as a working farm for over 115 years from before the French and Indian War until nine years before the start of the Civil War. After 1851 the land was sold several times but the barn remained in use as a barn until well into the 20th century. 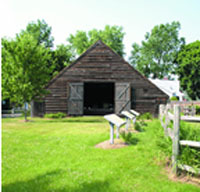 After restoration was completed, Bergen County opened the barn as a museum and county historic site. Wortendyke New World Dutch Barn, exhibits, artifacts and rare pictures of farm life in the Bergen County area. Garden state parkway north or south to Ridgewood/Oradell exit. Take Oradell ramp to first traffic light that's Pascack road and continue for 5 miles to Wortendyke Barn Site.